The Byer of Maine Moskito Kakoon hammock (yes, it is spelled that way!) represents an incremental change to their previous model, the Mosquito Traveller, which has been discontinued. Fans of the Mosquito Traveller will note the similar, lightweight parachute nylon fabric and fine mesh mosquito netting, but gone are the familiar rope nettles and clew. The main changes include a full-length hammock instead of using rope nettles on the ends. 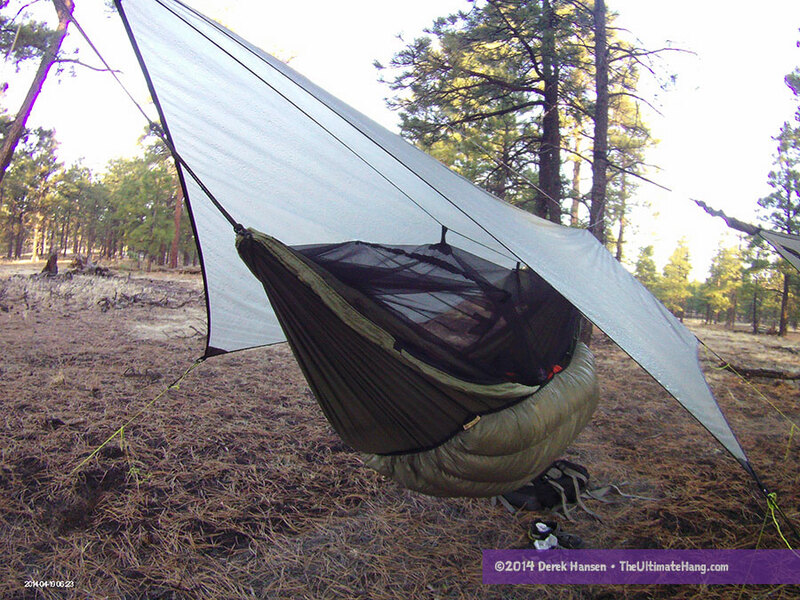 This, along with the full-size netting, provides more room inside the hammock. Another change is the inclusion of thin spreader bars to hold open the netting. These rods are 19.7 in (50 cm) long and are permenently installed in the bug netting. The Moskito Kakoon has sewn end channels where the suspension system is threaded through. The bug netting joins the hammock fabric at this point. Let me start with the “Ugly” to get it out of the way. Byer of Maine included some 5 mm accessory rope and two steel S-hooks as the suspension system for the hammock. Several years ago, a rope-based suspension system wouldn’t have garnered so much as a passing glance, but we’ve learned a lot since then. Rope-based suspension systems can do a lot of damage to an anchor point, especially trees, and are therefor generally avoided, particularly when used to wrap around the anchor. I’m disappointed that Byer of Maine didn’t include some webbing straps with the hammock. I replaced the stock ropes with lightweight end loops and webbing straps to create anchor points around the trees. The good news is that the suspension is easily replaced and upgraded. I recommend investing in a pair of webbing straps, at least 1 in (2.5 cm) wide to create an anchor point around a tree. The included rope can still be used as the suspension, so long as it is connected to the straps and not used as the anchor point. So, not all is lost with the included rope. Indeed, you can take and cut two 2 ft (61cm) sections from the included rope and use them to tie up two continuous loops that can be threaded into the end channels. These create great connection points to the hammock and allow for multiple suspension systems to be used. This was the first modification I made to the Kakoon after inspecting it. The only other misgiving I had about the Kakoon, interestingly enough, was the included rods in the bug netting. My hope was that these rods were removable, but unfortunately, they are not. So, while not necessarily ugly or good, for me it lands somewhere in-between. I’ve heard that a lot of folks like the rods permanently attached, so here are my reasons for making them removable. The reason I’m not a huge fan of the installed rods has everything to do with packing. 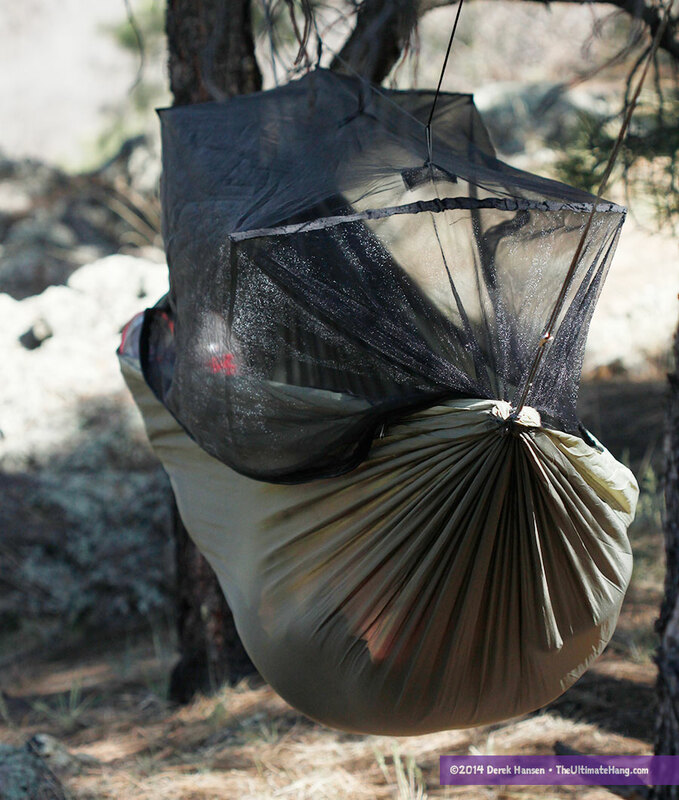 Without the rods, the Kakoon hammock can stuff down to grapefruit size and can fit about anywhere. 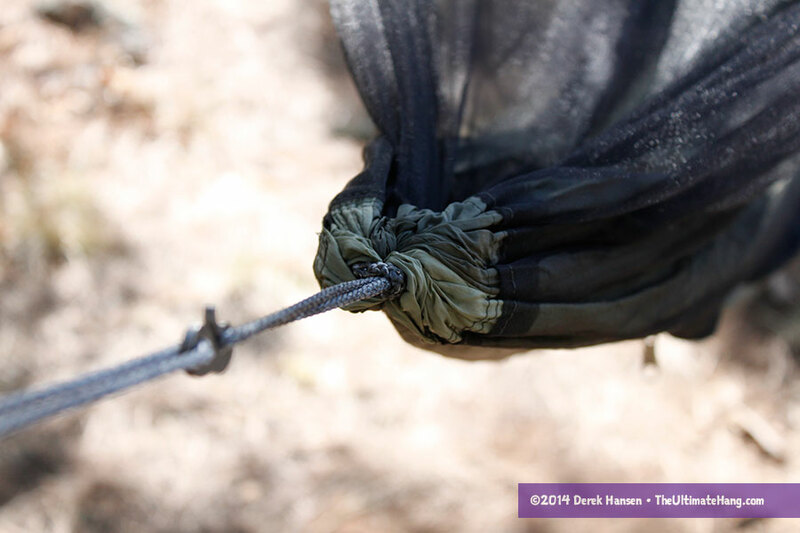 With the rods, the only way to pack the hammock to prevent damage to the rods, netting, or hammock, is to roll it. The included stuff sack is more than adequate to hold the hammock (and a little more), and is tall enough to accommodate the rod’s length. The long stuff sack presents some packing challenges, particularly with the rods inside. I don’t like or recommend packing a hammock on the outside of a pack due to rain and moisture concerns. Inside a pack, the hammock should be stored vertically. You need to be very careful when considering “net less” mode with the Kakoon because of how the net spreader poles can stress the netting. The other challenge with the rods is using the hammock without the net. 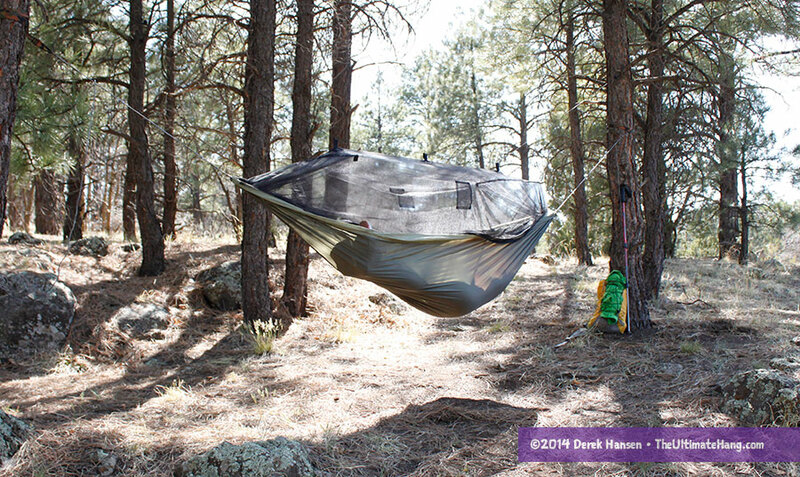 With similarly designed hammocks, you can simply flip the hammock over with the bug net on the bottom and then use the hammock without the net. When I tried this with the Kakoon, I was at first concerned as I noticed the rods were putting a lot of pressure on the netting. I very gingerly spread the hammock apart and then sat inside. Within a few moments, one of the rods ripped through the netting. Thankfully, the netting was reinforced so there were no holes exposed for bugs to get through. For those interested, you can remove the but net spreader poles if you want with a little after market modification. Simply make a small incision on the inside of the hammock in the bug netting, being careful not to expose any holes in the outside. The poles can then be removed and replaced as needed. Here’s some more good: The hammock is suprisingly light and agile and yet very durable. The fabric isn’t as thick or coarse as many parachute nylon hammocks and it feels smooth. The Kakoon fills the void left when Grand Trunk Goods eliminated the Skeeter Beeter Ultralight as a lightweight bug-free hammock shelter. 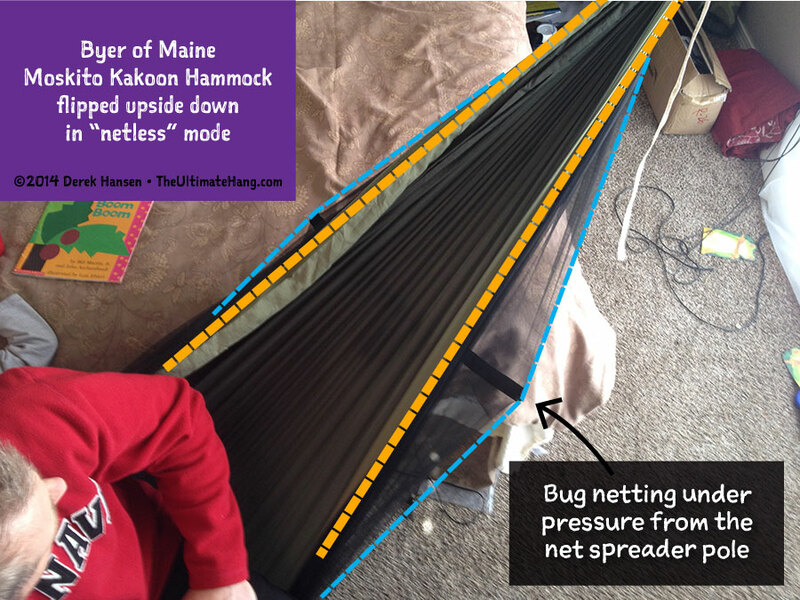 This makes the Kakoon one of the most affordable and lightweight bug net hammocks on the market. Another thing I liked about the Kakoon was the string included to pull up the bug netting off the occupant. A plastic hook and a sliding cord lock are installed on both ends of the cord. The cord lock represents an adjustable clipping point or toggle point for the hook so you don’t need to use any knots. Depending on the distance between and size of your anchors, you can wrap the cord around to clip the netting up. I’ve also clipped the cord through the webbing or suspension line with success. The cord lock makes it easy to make an toggle point; it’s quite a unique usage. The Moskito Kakoon Hammock comfortably situated beneath a MacCat tarp. Oh, and one more thing (and this is purely subjective): I love the color. The muted olive drab is a fitting color for the outdoors. The Kakoon has a great price point that will be attractive to many, especially if you’re just getting started with hammock camping. But this isn’t just an entry-level hammock—the weight and pack size are also very attractive to folks looking for a lightweight hammock shelter—and, it’s not often that you can find a jungle hammock that is lightweight, durable, and inexpensive! The zippered bug net and spreader pole provide a roomy interior, but the real limiting factor for this hammock will be the size. At only 9 ft (274 cm) long, some folks might find the hammock a little tight, although this is actually longer than most of the Hennessy models, which are very popular. This is a bit more subjective since I’ve known tall folks to enjoy small hammocks, so take this for what it is worth. Thanks! The price does make this hammock a great deal. What questions do you have about hanging from trees? Have you seen my post about webbing straps for new hangers? Hanger noobie here. I thought from reading your book and other various sites that you wanted mosquito netting to go all around you because they can bite you from underneath through the hammock? This doesn’t look like it does that. Also the price is awesome. My first and only purchase so far is a trek light and it was more expensive then this without the ropes and netting. Yes, Mosquitos can sometimes bite through the bottom of a hammock, but there are many easy ways to defend against that. If you use a sleeping bag, under quilt, or pad beneath you, you’ll be well protected. Treating your hammock with permethrin is another way to protect when you don’t want or need anything beneath you. Bites from below are not a common problem because we often have something beneath us. Ok, Derek…..we are new to this. I bought by son (10) a Eno hammock and it was stolen before he even got to use it. We are going camping this weekend in the mountains (we live at the beach) and I want to buy him another one. I saw this and loved the idea due to price and netting. How does this brand compare to Eno and is there issue using it reversed without the netting? Just trying to decide which hammock to go with. Thanks for any info. ENO and similar hammocks are great rough and tumble hammocks. The Byer hammock has the same fabric but it is lighter. I haven’t done any stress testing but I wouldn’t be as rough with the byer. That said, I don’t hesitate to recommend it. It is a great hammock at a great price. If it were me, is simply remove the rods in the netting and then there are no issues. Hi there! Thanks for this review. I am considering hammock camping for the first time later this month and am looking for a good starter hammock. This seems ideal with the mosquito netting for protection from bugs, but I am concerned about the size. You said it might be tight for some. I’m about 5’9″. Do you think I would be comfortable in this hammock or do you recommend something bigger? Thanks. I think you would be fine with this hammock. I am 5’10” and I felt it was just right. Oh! One more question… do you think that a simple 8x10poly tarp would be sufficient as a rain fly for this tent? Yes, absolutely. In fact, a simple 8×10 blue poly tarp works well for nearly all hammocks. It’s a great starter hammock. Hi im 6″ 4 and 230 pounds would this work or should I go for something more ruged. I would get somethig bigger. I know tall folks who don’t mind small hammocks, but generally speaking you’ll be more comfortable in a larger hammock. Hello Derek, Thanks for the great website! I just purchased your book and I am really looking forward to reading it. I’m trying to make up my mind on either this hammock or the Grand Trunk Skeeter Beeter Pro as my first hammock, do you have a recommendation either way? How tall are you? Do you care about how light the hammock is? Over 6 ft and I’d get the skeeer. Lightweight backpacker? Go for the Kakoon. I’m 5’7″, so maybe the Skeeter is a bit big for me, I will get the Kakoon. Thanks for the help! Hey Derek, I picked up the Moskito Kakoon and a set of Eno Atlas straps based on your recommendations, and so far it seems like a really fun and easy system! One more question if you don’t mind – What kind of knot should I tie to make a continuous loop like in your video? Would it be a problem to just tie a lark’s head to a carabiner with the existing Kakoon ropes to shorten then instead of making a continuous loop? Thanks! I use about a 12-14 inch length of rope and tie a loop with a fisherman knot. I feed the loop through and tie a larks head on the hammock. You can secure the loop to the carabiner with a larks head if you want too. Ok, great, Thanks again for the information, and for all the great videos as well! You’re welcome! More to come! Hello, Derek. Great review. Can I sleep at an angle in this hammock, keeping my back relatively flat, as in one of the Hennessey hammocks? Thanks. Yes, of course! All gathered-end hammocks can do this. The difference with Hennessy is that the bug net is sewn with an asymmetric design, which prescribes the diagonal lay. Open hammocks, and jungle hammocks like the Kakoon allow you to lay diagonally in either direction (head left/feet right; head right/feet left). I fell in love with hammocking in the older version of this hammock with the nettle strings( sale price was10$,no netting). Even though there was a tangle factor, it was very long and light. After using a more expensive gathered end hammock, I will be going back and buying the same older style but with netting. The older version is still around, but looks like this is the replacement at Nearly 3 feet shorter. There was something about that type of hammock that was very comfortable. The fabric? The length? The strings? My guess would be the length, but I am also drawn to some of my first hammocks. Nostalgia? Hi I noticed you mentioned the options of threading a whoopie sling or a continuous loop in order to enhance the suspension system. I was curious what whoopie sling would you suggest getting for this particular hammock? I was looking around and noticed that some are specified to certain hammock brands and some seem universal. I would argue that all whoopie slings are universal. Some retailers may recommend them for a certain hammock but it’s mostly marketing.